When a police officer comes knocking, it’s not for what we assume, being rousting him up and kicking him out of town, which is one solution to the homeless problem in any given area. It’s not even for the break-and-enter. It’s to tell him that the man who killed his parents is about to be released from prison. Up until that point, we aren’t given a rhyme or a reason as to why our bearded protagonist lives as he does. It’s debateable whether we need a pat psychological reason, because the grimness of his circumstances are representative enough. After this moment, it’s not necessarily true that we understand why he’s ended up feral, but at least we have some idea of something that must have occurred. It’s unlikely that anyone chooses to be homeless. The mentally ill, those with nothing, rarely choose to be mentally ill or to have nothing. Do we assume that this chap, Dwight (Macon Blair), chose to become homeless because of his parent’s violent death? Whatever the reason, however it happened, we get the clear idea that Dwight lost the plot at some stage, but now he is reinvigorated with purpose, with squirrelly-eyed, nervous purpose. The oldest purpose of all since one guy slew his brother with a stone: revenge. Dwight wants revenge. Someone wanting revenge in movies for the murder of their parents isn’t that common, I don’t think. Usually the person wanting revenge is male, if not nearly always, but they’re usually desirous of revenge because of their lady love having been brutally murdered. And if it’s their child’s death, well, that’s the jackpot, really. The feeling that they’re feeling is one we’re meant to see as universal, endlessly relatable. It’s an easy path to take. Audiences tend to accept it unconditionally, no matter how violent or vigilante-ish it becomes. Most films don’t really try to deconstruct it, the ideas behind it, or the worthiness of the endeavour, because it’s inherently righteous to avenge one’s loved ones, isn’t it? Sure it is. But there’s a sub-genre of these kinds of revenge films where the idea isn’t to get us, the great unwashed in the audience watching the great unwashed on the screen, to side with the one getting revenge. Nor do they necessarily want us to side with the ‘scum’ the ‘hero’ wants revenge on. But they do want us to appreciate that getting revenge isn’t just messy, it’s pretty unhelpful. Of course even the ‘best’ revenge flicks never allow for the situation, the dead, dishonoured loved one, to somehow magically come back in the end after satisfaction has been achieved (like in those terrible Crow movies). All they allow for is the idea that once you kill the ones responsible, balance has been restored in the universe, redress has been made, and then whatever comes after will inherently be better. What if Dwight, who is not a violent man, or a fighter, or a hardened crim, as far as we know, gets revenge, but there are no parties for him afterwards? No parades in his honour? 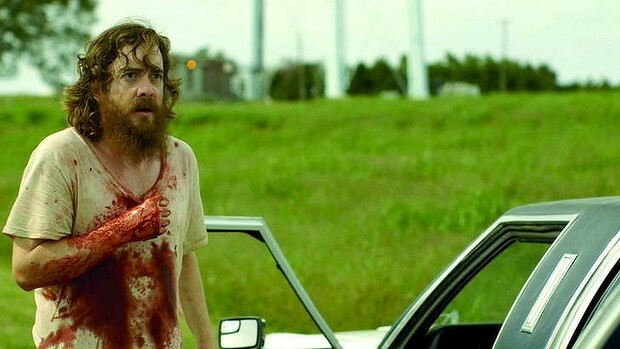 Blue Ruin subverts the manner in which these narratives usually go by having the protagonist achieve his ambitions quite easily, quite early on. Killing a man shouldn’t be so easy, and it’s not: it’s hard messy ugly work. Jeez, it would have been way easier if Dwight could have gotten his hands on some guns, hey? The whole film is so keenly made that it really has a well crafted feel to it. The attention to detail is incredible, but not in the way that you associate with diorama over-composed constructions like the fussy films of Wes Anderson. It’s in the level of thinking put in to what the characters do, and what the repercussions are at almost every stage. Everything means something, and every action taken or not taken has flow on effects. Dwight doesn’t have a hope in the world of achieving his original intention, but his actions mean he can’t just stop and disappear again, at least in the world that he chose not to be a part of for so long. I’m guessing, because of some other plot developments, that fifteen or so years passed since the original crime that rendered Dwight a lost soul. And now, fifteen years later, re-entering Virginian ‘high’ society, he’s not really equipped for what he’s now created. At least he’s an intelligent and resourceful guy. It’s an amazing performance from someone who doesn’t look like the kind of person you see as the main character of an American film except when it’s an intense, low budget character piece like this. Macon Blair’s performance is one of the best I’ve seen this year, and his physical transformation from a homeless revenant to a ‘regular’ looking guy just trying to stop the carnage he’s unleashed is phenomenal. As much of a quiet character study as it might be (there’s very little dialogue in this flick), the film wisely avoids psychoanalysing any of the characters, even as it’s giving them exits and departure points that they can’t bring themselves to take. It’s spare and sparse, in that sense, and is the better for it. Above all, the further the film goes along, the further the point gets away from being able to argue seriously that revenge works in any meaningful way to make anything right. Anyway, especially in the American context, in an America that loves its guns so much, Dwight figures out that it’s less and less likely that you could ever really get conclusive and final revenge on an entire clan of gun loving hillbillies who have more guns than teeth. You can’t win, even with an array of guns yourself. In a deliriously blackly comic moment, the closest Dwight gets to actual revenge is when he pisses on a certain person’s grave, and even that is obviously a thin consolation. I didn’t know it before hand, it became obvious afterwards, but we see Dwight grimly forcing himself to drink glass after glass of water, in the way he prepares for everything else. It’s a wry moment indeed. Though it is distinctly low budget, great care is taken to put everything together in a competent and effective manner. The scene at a home when Dwight is being attacked by two hillbillies is remarkable in the amount of tension it generated, and it’s very well shot. The touch I especially enjoyed was the way in which Dwight tries to create the illusion of someone being upstairs, through the turning on of a light, and the running of a tap. After a lot of time passes, so much bad stuff happens in between, but when Dwight returns to the house, I was gratified to see that the light was still on and the tap still running. It made me laugh, but it was because I appreciated the meticulous thinking behind it. It’s the kind of thing I respond to. Blue Ruin is a very keen flick, where the messiness is in the repercussions and the outcomes, not in the performances or the production. It’s truly a low-key marvel from some interesting people with an outsider perspective on the genre. It’ll also make you never want to visit Virginia as long as you live, and, let’s face it, if you have all your teeth, you wouldn’t be allowed to anyway. 9 times the song Lighthouse Girl by Melbourne band Blue Ruin is one of my favourite songs of all time out of 10!